Convenient Location - Bright,Spacious, luxury 3 bed Villa, A/C and own garden. Casa Mima is a luxury, spacious 3 bedroom townhouse situated in the picturesque fishing village of Carvoeiro, one of the most beautiful spots on the Algarve. There is a large communal swimming pool with separate children's pool and Georges bar offering free wi-fi. Within the pretty gardens and in an easy 3 min walking distance there are a wide range of excellent restaurants and a well stocked supermarket. Carvoerio town centre with its beautiful sheltered beach is also no more than a 5 minute walk. The coastline in this area has magnificent ocean views with a mix of cliffs, coves, bays and beaches including Marinha Beach voted one of the top 10 in the world! Discounted golf on the nearby Pestana courses in addition to the renowned David Leadbetter Golf Academy. Tennis and Health Club/Gymnasium about 1km away at the Carvoeiro Club de Tennis. We can help you with plenty of activities too, golf, zoo, horse-riding, water parks, jeep safaris, boating and fishing. Slide and Splash is within 10 minutes taxi or car ride. We are a family of four that have been visiting Monte Carvoeiro for over 20 years, with and without children. The house has been decorated to our own taste as when we go anywhere we expect lovely, pretty surroundings, good beds and a wonderful place to relax and enjoy. We love the fact that you can walk everywhere and that the extensive fresh food restaurants and lovely wines can be enjoyed without worrying about driving home. Our children are now 16 and 19 and we have enjoyed taking them at every age as the whole place is very child friendly for all ages and we look forward to allowing them to go on their own with their friends in a few years time. We particularly enjoy the beauty of the beaches and can recommend many and the pool allows you to relax if you want a day off from the sand! We just love our house for the convenience for everything, the cool space is bigger than newly built properties. It has charm and character and has beautiful gardens with a wonderful cobbled square that is surrounded by restaurants within 2 minutes walk through the cobbled garden paths and the pool is just at the end of the winding path within under a minute. It is positioned within a 5 minute walk from the village which allows a little more exclusivity. The bright upstairs en-suite is large and has 2 double sinks, a bath/shower, bidet and toilet. Downstairs bathroom includes a walk in shower which is perfect for coming straight off the beach and has another toilet and sink. All working with a new boiler put in Jan 2016. Large spacious and cool living room with satellite TV. There is also a real wood burning fire for winter nights. We have a useful separate dining area opening onto a sunny outside terrace and garden which is perfect for BBQs. Pretty garden that also runs along the side of the villa . On request and at an extra cost. 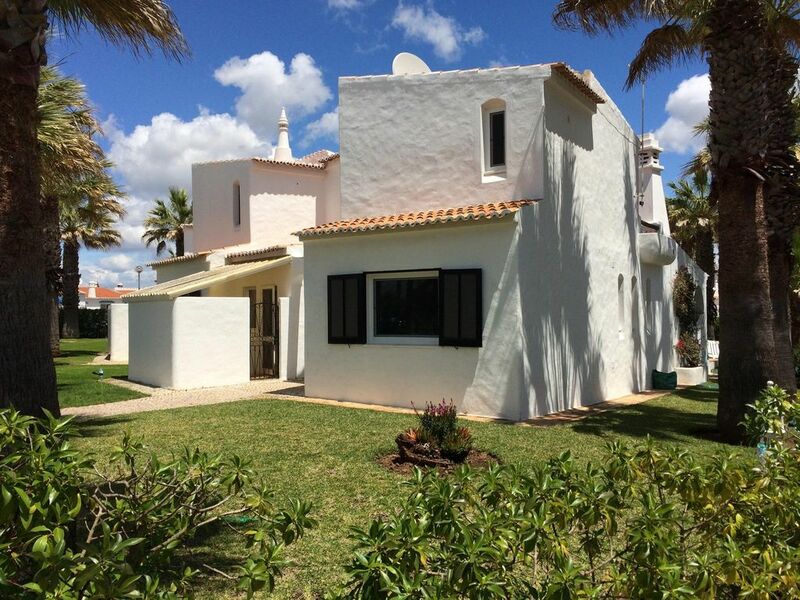 Gramacho and Pinta 18 hole Golf courses with David Leadbetter driving range and golf acadamy, plus tennis facilities are all within 5 mins drive and discounted. You can enjoy the fabulous courses and mix it with the opportunity to walk to the town to enjoy the local restaurants and wonderful beaches. A complete golf package can be organised on request including pick up from airport and to the golf courses from the house. If an additional mix of courses are required for any of the extensive courses on the Algarve, if requested these can be included in your package. Notes on The house is an end of terrace and is therefore larger than the average build. If you decided not to hire a car we would be able to suggest a transfer from the airport. There are a large selection of restaurants within walking distance that offer a variety of dishes and provide Portuguese gastronomy to Italian, Dutch, British, Thai, Chinese and Indian Cuisine. The position of the villa makes walking to Carvoieiros strongest attraction, its unspoilt beaches a real bonus and of course it's also within easy reach to local shopping with supermarkets and shops all within 5 mins walking distance Slide and splash is 10 minutes away . Portamao 20 minutes Outside: The patio area is quite private and in the sun most of the time which creates a nice place to sunbathe, and has everything to enjoy alfresco living, including a coal BBQ. The garden is pretty and benefits with extra space as it is end of terrace. The house is conveniently located close to the pool. From the house you can walk to a small Ali super supermarket which just adds to the overall convenience of our property . Utility Room: This is situated outside the kitchen door allowing great space for beach toys and drying towels etc. Includes washing machine. Cleaning / Towels / Linen / Maid service: House Towels and bedding changed every 10 days. - Once a week if booking for 14 days will include a maid service to clean. The washing machine is freely available within the utility area . Other: All rooms are spacious and cool, the garden is very pretty, facing the sun but with some natural shade from the palm trees that are in the garden. There is a terrace with table and chairs outside and a BBQ. Internet facility at £10 per week is available. Lovely spacious villa with everything you need for a comfortable stay. The outside space is private and a good place to relax after a busy day at the beach or by the pool, both are close by. Perfect location. Excellent communication with Jane the owner. I would highly recommend staying there. Brilliant villa! Perfect location for everything! Jane is a lovley owner with brilliant communication. Very well looked after villa with alot of extras. Can not wait to book for next year. Fabulous holiday in a great location! We have just returned from week at the villa and it is fabulous. It is a real home from home, with everything that you need for a holiday. Jane was a great host and kept really good contact both on the lead up to and during the holiday. The villa is in a great location, with easy access to the pool. It is about 5 minutes walk to the beach, although this is quite steep on the way back up. The area is lovely, with some great little restaurants. I would definitely recommend and would love to visit again the future. Just back from a fab holiday in Carverio. The apartment was very spacious with everything you need and walkable to everything, we really liked the large light and airy bedroom upstairs. Jane was also really helpful, very accommodating and easy to reach. We went to lots of the beaches, the coastline is stunning and also used the hop on hop off bus that goes from right outside the apartment. We got it up the Trovolli sky bar which has amazing views and cocktails! Lots of lovely places to eat locally, also the broad walk is a really lovely walk. My daughter is 10 and was constantly occupied with the beaches, pool, slide and splash and tennis just down the road. Would definitely recommend both the apartment and Carveofor a brilliant holiday with loads to do for both adults and kids! This was our 4th time holidaying in Carvoerio and by far the best place we have stayed in. The villa is beautiful and has everything you could possibly need. It's very spacious and the garden is lovely. The town is only about a 5 minute walk but there are also some lovely restaurants so close to the villa so the location was fantastic. We wished we had booked longer! Will definitely return to this villa again! If you are a keen cyclist we can discuss the option to include bikes for your holiday as it is a sport we enjoy. This area of Portugal is demanding, the roads are good quality and there are a selection of great hills that can push your fitness. The scenery is spectacular. Tennis/Fitness club is also within 3 minutes drive and we can also discuss lessons/bookings etc as we can get a good discount.The fitness club is partucuarly good offering aerobics, power hour, zumba, etc with great enthusiastic teachers. Within the club is a pool, coffee shop and gym. Town and beautiful beaches are all within 5/10 mins easy walking distance with caves to adventure into. The town has been redeveloped to promote less traffic as its quite small and quaint, it has been tastefully cobbled which adds to its fishing village charm. During the summer there are little stalls and live music by the beach in the evenings. We have also experienced beaches just on the West Coast which are exhilerating if you like the waves, about 45 minutes drive. Faro airport is 40 minutes away. Car hire is not essential as our villa is so conveniently positioned and we can organise car pick up to villa if required. If you dont mind driving, to save on cost, also look at flying to Lisbon...the drive down takes about 2 hours on a new motorway. We can help advise you on car hire etc depending on what type of holiday you are looking for. Lagoa 5 mins drive, only another 5/10 minutes to Silves with its medieval cathedral and castle and historic market. Lagoa wine district 5 minutes - see how wine is made. West Coast Beaches 45 minutes - great surf. Slide and Splash - 10 minutes in the car. Monchique Spa - 25 minutes. Tennis and fitness club - less that 3 mins drive. Golf Clubs and driving range - 5 mins drive. Easy access to supermarkets, shops and banks in the village within a beautiful 5 minutes walk. Reception area (24 Hours) - for any immediate needs. Aldi just opened up so costs can be kept low ! Booking Notes: We will require a £50.00 deposit for breakages that may occur which will be refundable on return. Changeover Day: Changeover day can be any weekday, arrival from 2pm and departure 11am latest as flights are much cheaper in the week, but you will need to ring to discuss and confirm availabilty. Notes on prices: Prices are for the property per week in UK Pounds. Upon booking 50% of the rent is payable, the remainder is due 6 weeks before the start of the rental period.